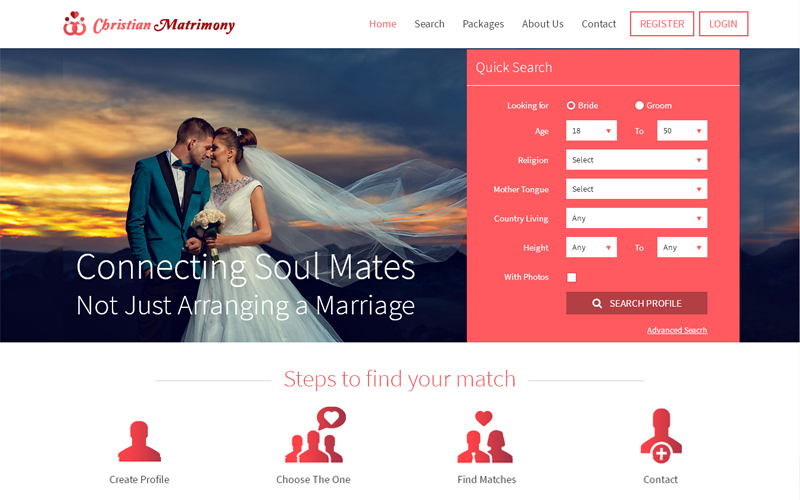 Ever since the evolution of developments in technology, the find of bride and groom in traditional system search of life partner is taking a new turn of getting popular by our Christian Matrimonial Script is based on the fully Christian religion-oriented matrimony which can search for the specified community. In the world one-third of the peoples are in the Christian religion so we occupy the space to enhance their way of getting married and developed completely professional suits to follow concentrate on specific area of their religion familiarize caste followed by sub-caste in all the entire aspects. Our Catholic Matrimony Script includes horoscope of a particular person based upon the date and time of their birth the astrological chart is present because it is important role while arranging a marriage whether the bride and groom are compatible to get married or not. The main goal of our script is to create a relationship between profile posting and Profile looking users. The individual user makes the profile by posting their details to get the suitable matches. After the end of every successful find of bride or groom can leave a successful story in the site. We designed this Christian Wedding Ceremony Script based on the technology MySQL database which benefits to store millions of database and retrieve the data of profile within the fraction of second without any of interrupt occur in-between done by the scalability of a site. Admin manages the details of the profiles registered within it and views the statistics of the site and control on the membership plans activated users to pay. It holds many of the revenue models such as membership plans, banner ads management and Google AdSense etc.., Admin can manage the content throughout the site like homepage slider design, about the site; contact us, security tips and terms & conditions. Also, the PHP Matrimonial Script is multi-purpose for wedding bride or groom search that can be easily customized to any of the religion that we will provide you with 100% source code to you. We professionally developed Readymade Christian Wedding Script is built in SEO friendly which will be easier for good promotion manner to connect with search engines. We have emerged as one of the popular Matrimonial Script developers all over in past 16 years across 63 countries. Our script enhances high security, user-friendly clear source code facility, smooth navigations and cost-effective. We are offering support 24×7 for your queries arise about issues to help you out and white label product delivery from us to mark your trade in the business. Technical team always available for your issues, they definitely stay in touch with you and keep you updated through initialization or customization process. I purely endorse PHP Scripts Mall. Catholic Matrimony Script has wide diverse solution for Christianity marital Beuro. Well versed matrimonial source code. The whole process is remarkable. From the start to end team have given right attention towards the customization. As beyond my expectation they did perfectly.